When selecting the best toys for 4 year old girls, we kept in mind the fact that your little girl is growingr and changing every day, and the way she engages in play is changing as well. Her fine motor skills are much better, making it easier for her to use toys with smaller pieces. She is becoming more adventurous and fearless, ready for bigger challenges. Also, she is getting ready to start preschool, an emotional milestone for you both. Her ability to learn knows no bounds and she loves imaginative play. Your 4 year old girl needs toys that allow her to be creative, challenge her, give her room to grow and let her have fun! We took all of this into account when coming up with our list of the best toys for a 4 year old girl and made sure all the toys we picked combine learning, creativity and fun! One of the best ways for your 4 year old girl to learn is through fun activities and the Learning Journey Match It – Spelling is perfect for that. 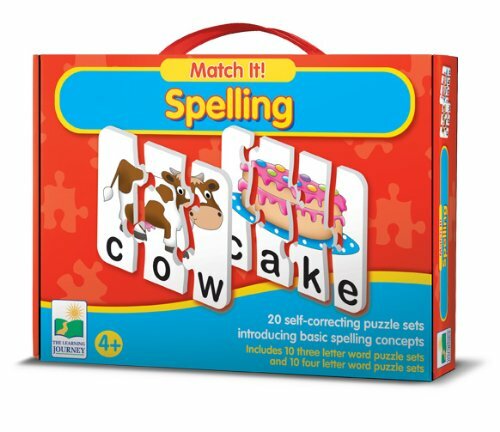 The set includes 10 four-piece word puzzles and 10 three-piece word puzzles designed to introduce your child to the art of spelling. Each puzzle when complete will show an object with the word describing that object on the bottom. The spelling for the object will either contain 3 letters or 4 letters depending on which puzzle your child tries to solve. For example, let’s say one of the objects on a completed puzzle is a cow. This would be a three-piece puzzle, so each puzzle piece would have part of the cow showing, along with one of the letters to spell the word ‘cow’! The wonderful thing about this approach is that your little girl is learning how to associate words and spelling with objects. This skill will stand her in good stead when she starts school. Having both three and four piece puzzle pieces provides her with a degree of challenge to really hold her interest and foster her inner competitive spirit. It’s also a great way for your little one to learn new words and expand her vocabulary as well as improve her reading skills. The Learning Journey provide Match It sets across a range of topics, so if your daughter really enjoys this one, you can choose a different topic next time to continue helping her learn in a fun and engaging way. You can give this as a gift to your child at any time of year. Several parents and grandparents bought it as a Christmas gift, and even Santa had it in his sack for some good children! Part of healthy childhood development is allowing your child to imitate what they see around them. The Learning Resources Pretend & Play School Set is the perfect toy for your 4 year old girl to do just that. It is designed to give children the chance to familiarize themselves with school through pretend play and fun! 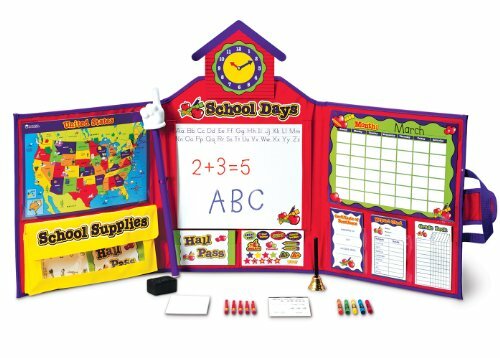 This Pretend And Play School Set comes with 149 pieces which include a grade book, stickers, hall passes, a dry erase board, crayons, a pointer, a double sided calendar, a double sided map and much more. It folds flat and has a hook and fastener, and measures 38″L x 16″H when fully open. Winner of 5 awards, it is the perfect interactive toy to get your daughter excited about learning and education! Perfect for group play, children can takes turn playing the role of teacher and student. And for even more fun, they can have their parents, grandparents, aunt, uncles and relatives be the students while they play teacher! This is a great educational toy to help your four year old girl develop a love of learning. It also helps you as her parent to instil in her good positive feelings about school so that when she starts, she’s not as scared. Fantastic bonding toy as your child plays teacher and gives you detention for breaking their “rules”! 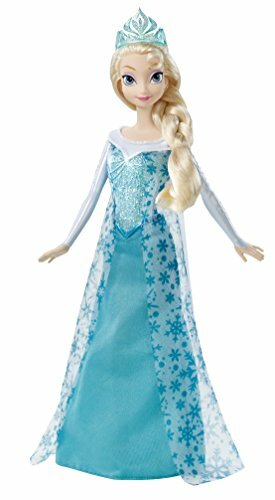 If your little four year old girl is a Frozen fan, then this beautiful 12-inch Disney Frozen Sparkle Princess Elsa Doll is sure to win you parent of the year! Elsa comes with white blonde hair, big blue eyes, her trademark beautiful blue gown with her ‘icy’ white cape overcoat, and her very own blue tiara. If your little princess has watched Frozen multiple times like most fans have, then she’s going to have a fantastic time renacting scenes from the movie with this gorgeous Elsa doll! Yes, you most likely will have to listen to ‘Let It Go’ over and over, but the look of joy on your little girl’s face, will make that moment all the more precious and worthwhile. Elsa will most likely become a firm favorite in your daughter’s doll collection, encouraging her to engage in imaginative and pretend play. She will enjoy creating new adventures for herself and Elsa, in magical kingdoms in faraway lands! We’d like to point out that the upper half of the dress is painted on the doll, but the crown, overcoat, and skirt of the dress does come off. One thing to make you aware of is the fact that this Elsa doll has been discontinued by the manufacturer so supplies may be limited. If this is the doll you’re looking for, then you may want to purchase it soon. This is the perfect gift for your little 4 year old Frozen fan! Helps your child increase her confidence and self-esteem as she mimics being Elsa, renacting all the scenes with her very own Elsa doll, and singing her little heart out! The perfect birthday or Christmas gift for any young Frozen fan! 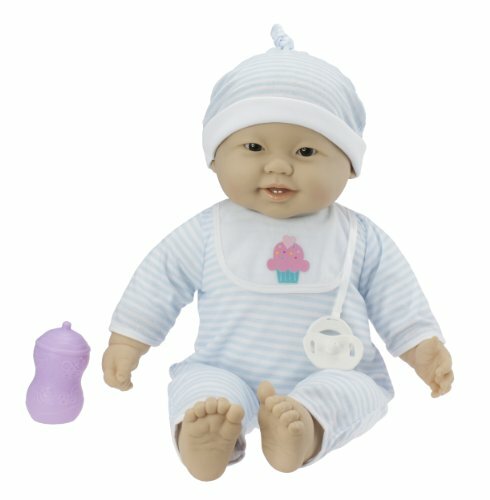 Your four year old little girl is going to squeal with delighted when she sees this JC Toys ‘Lots to Cuddle Babies’ Asian 20″ Soft Body Baby Doll and Accessories ! She comes in a variety of different ethnic backgrounds, including Asian, African American, Hispanic, and Caucasian. Each doll has realistic arms, legs, feet, and face, a beautiful soft cloth body, all of which combine to make this baby doll look and feel like a real baby! And if that wasn’t enough, these dolls also come with a pacifier, bottle, bib, and other accessories which your child will simply love! The dolls even have wrinkles and dimples – how cute is that! Your little girl is going to so enjoy cuddling this baby doll, nurturing her, minding her, singing her to sleep, holding her and so much more. She will enjoy pushing her new baby doll in a stroller and taking her to the park, to the shops and on other trips. These dolls are more life-size than many other baby dolls, and will make a great addition to any little girl’s doll collection. What little 4 year old princess wouldn’t love to own this incredible and amazing Barbie Dream House in gorgeous girlie pink! It has a whopping 7 rooms across 3 floors, is ultra feminine, and stands 4 feet tall! All the rooms have modern designs, and this outstanding Barbie doll house comes with over 70 accessories to really engage and entertain your little girl. These accessories include things like furniture pieces, place settings, appliances, removable sink, fish tank, chandelier, flat screen tv, and even a remote control! All of these were designed to make the dollhouse as realistic as possible for your daughter. Here’s something real cute – the flat screen tv is an actual phone holder! Yes, you can put a real smartphone in there and play something on it so that it looks like Barbie is really watching TV! But if you don’t want to do that, this dream house comes with stickers, so you can use the one for the tv. This beautiful Barbie Dream House has a an entry-way and lovely kitchen on the first floor, a dining room, bathroom and pet room on the second floor, and a bedroom and ultra chic walk-in closet on the third floor. There’s also a garage door that flips open so that Barbie can drive in her car (sold separately)! Your four yr old daughter will squeal with excitement when she sees the working elevator which uses a pull mechanism to transport her doll up to each floor! And if that wasn’t enough, there are real sounds and special effects such as the fish swimming in the aquarium and lots more! 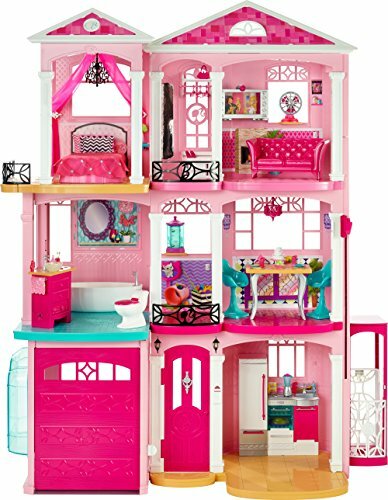 Now because of the sheer size of this dollhouse, and all the accessories that come with it, it’s perfect for your little girl to play with other siblings or her friends. She and her friends will have a whale of a time coming up with all kinds of storytelling adventures for their Barbie dolls, Elsa and other favorites. What’s more, it’s a fantastic toy for you to enjoy with your daughter for special bonding time and creating precious memories. Made of plastic, this doll house actually snaps together. The bathroom takes 3 X AA batteries (not included) and provides all types of fun sounds and special effects. This dollhouse is the perfect gift for that special birthday gift or a present from Santa or parents at Christmas. Perfect for encouraging your little girl to engage in hours of imaginative and interactive play. Lots of parents said that their daughter would have Barbie hosting lots of ‘imaginary’ house parties, inviting all of her other little figurines, dolls and small stuffies! If your 4 year old girl is an avid Barbie fan, then she is going to absolutely love the Power Wheels Barbie Kawasaki KFX from Fisher Price! It is one of the few quads made especially for girls and it comes in a gorgeous girlie pink color. This Barbie quad features power-lock brakes and has a 12-volt battery and charger. It runs at speeds of 3 to 6 mph in forward and 3mph in reverse. It has a high-speed lockout feature for beginners so you as the parent are in full control of the speed your daughter drives at. 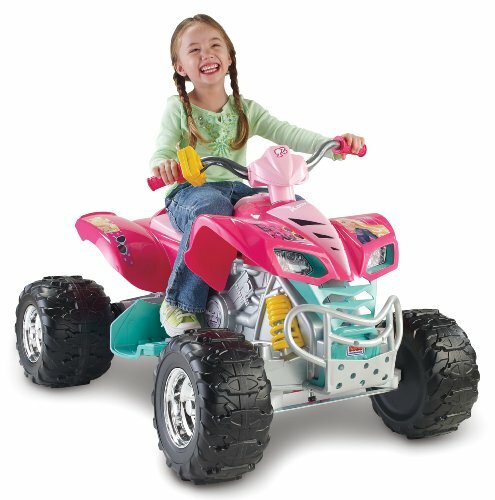 The Power Wheels Barbie Kawasaki KFX is known as the go-anywhere ride-on toy, because your little girl can ride it through mud, on grass, on gravel, and any other surface. It is suitable for all-terrain driving and the perfect ride-on vehicle to give your young rider a taste of ‘real’ driving! If your daughter starts off using the quad at 3 mph, then that’s a fairly safe speed. You will be able to walk behind her, but she still gets the thrill and fun of driving. As she gets older and more used to driving the quad, she can move up to the 6 mph speed. Just think of all the amazing adventures your little four yr old girl can have with her very own Power Wheels Barbie! This delightful Barbie quad has a maximum weight capacity of 65 pounds. Parents also like the fact that it seems to work very well on all kinds of surfaces, including sidewalks, gravel driveways, uneven terrain and more! If your little four year old girl is into role-playing and pretend play, then she’s really going to enjoy the Play Doh Doctor Drill ‘N Fill toy! Your little princess gets to play dentist and practice making teeth, filling cavities in them, making braces and a whole lot more! This Play Doh set comes with a play head with ears, tweezers, a mirror, braces roller, electric drill, dentist tool and toothbrush presser. It also comes with 1 x 5 ounce and 2 x 2ounce cans of Play Doh in White, Silver and Red and the drill takes 2 AA Batteries. 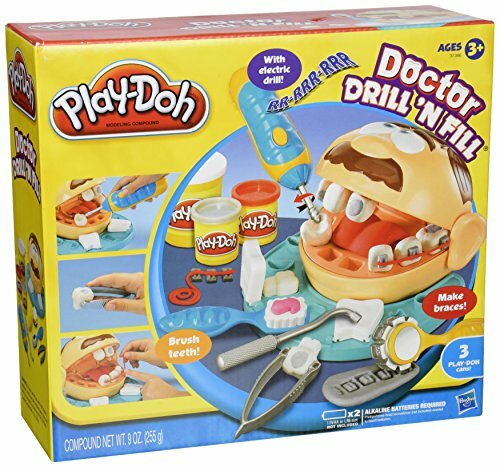 A wonderful and very engaging toy for your daughter to enjoy for hours on end as she creates her own imaginary world of being a dentist dealing with lots of different patients with dental issues. It is also an excellent toy for you to play with your daughter, as you can be her dental assistant, which makes for some wonderful bonding time together. If your 4-year-old girl is interested in wanting to be a dentist, then this is a great toy to encourage and nurture that interest, even if it wanes over time as she gets older. Suitable for girls and boys, this is a fun activity play set design to entertain and engage children. Bet your 4 yr old little girl loves going to the playground, going down the slide fearless and swinging as high as she can to try to touch the clouds! Well now with the PLAYMOBIL Playground Set, she can relive her own fun experience over and over and create all kinds of great adventures. 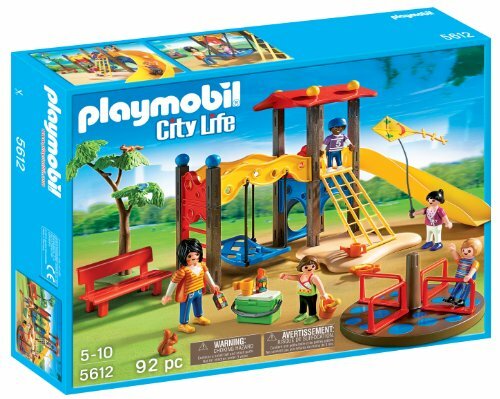 This playground set comes with a slide, a swing, an adult figure and 4 children of different race and gender, and includes fun items such as a kite, park bench, cooler with snacks, sand toys and even a merry-go-round. All in all, there are 92 pieces in this wonderful fun-filled set for your daughter to enjoy. For even more realistic fun, she can turn the heads on all the figures, make them sit, stand, and bend them. She will be able to have the figures go down the slide, sit them on the swing and give them a gentle push, or have the ‘family’ have a picnic at the bench! There’s no end to the types of adventures and stories that your little girl can create for her playground ‘family’! This playground set is great fun and will keep your four year old engaged for hours on end. 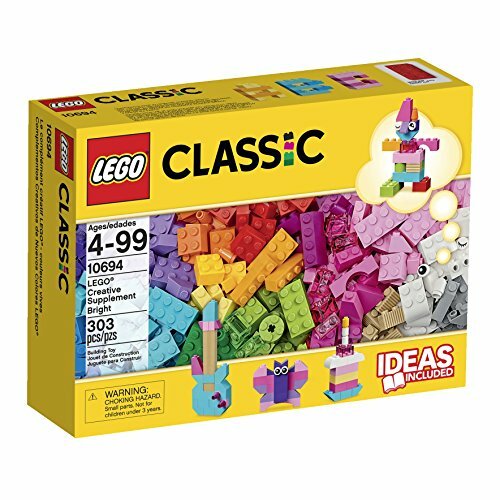 Your 4 year old girl will love all the fun things she can create with this LEGO Classic Creative Bright Supplement Set! With 303 brightly colored pieces in all, she will have a choice of 20 different colors including lovely shades of oranges, pinks and purples. Your little girl can build a variety of different items with this kit including animals, butterflies, birdhouses, flowers and much more. Plus she’ll get a booklet that makes getting started really easy. Made of sturdy ABS plastic, these bricks come in a wide variety of shapes and she’ll also get 4 pairs of eyes so she can make all kinds of weird and wonderful little critters. Plus these LEGO Creative Bright bricks can be mixed with other LEGO bricks and sets for even more building fun and unlimited creativity. There are enough bricks for both individual and small group play. So your daughter can have fun with her friends or play independently on her own. While little girls love all the bright colors and fun shapes in this set, lots of little boys have a blast with this set also. This LEGO Classic Creative Bright Supplement building set is perfect as a starter kit, can be used on its own, or it can be added to other LEGO building sets. It’s a wonderful toy that will last for several years or more. Kids love the bright colors and fun shapes of all the bricks! If your 4 year old girl loves to build things, then this colorful Magformers 30 Piece Set will be right up her alley! It comes with 18 square pieces and 12 triangle pieces in an assorted rainbow of colors. The pieces use something called Neodymium Rare-Earth Magnets to allow them to connect together easily. Your little girl can create all kinds of 2D and 3D structures using this building kit, limited only by her imagination. She will be able to create her own beautiful flower, microphone, towers, beautiful houses and other types of buildings, and even a ball! Included with the set is a booklet giving her lots of ideas on things to create. The really great thing about this Magformers set is that the pieces will always attract because of the magnets and they will never repel each other. Your daughter will hear them click when they touch and connect. What this means is that children can be as adventurous as they want with their creations and they’ll never get frustated because the pieces ‘don’t fit’. This is a educational but very fun toy that allows your daughter to express her creativity in a mathematical and scientific way. While this set is small, it can be used as a starter set for your little four year old girl as it is compatible with other Magformers kits. 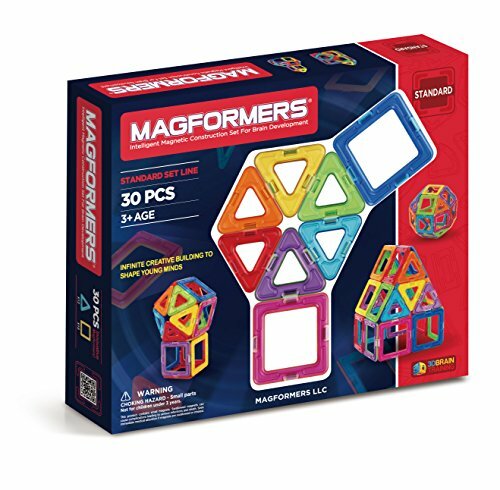 This Magformers set is fun, colorful, and perfect for imaginative building, and is ideal for both girls and boys. Lots of parents have said that their kids love this set and most importantly, it is so much fun!